Most of the healthiest foods available (such as fresh produce, fresh fish, or even fresh meat) don’t carry a food label. But even then, there are choices to make: organic, local, pasture raised, etc. Because most consumers find themselves purchasing foods with nutrition labels or health claims on a regular basis, here are 4 tools to help you read, understand, and compare food labels. 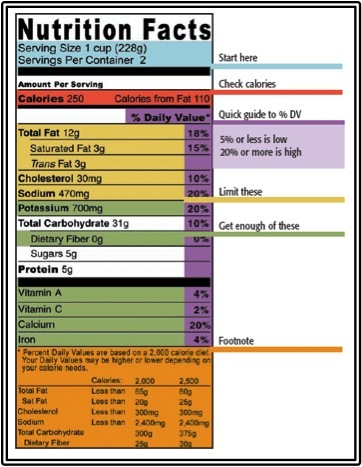 Below is a basic diagram on how to read a nutrition facts panel. Here are some things to remember… If there is more than 1 serving per container (such as in the example below) and you eat the whole container, you must multiply the numbers by the number of servings (so below, the total contents would have 500 calories, because of the 2 servings. The yellow nutrients are ones that we usually have too much of, so it’s best to limit those. The green nutrients are the ones that we need to work on getting enough of. Lastly, although it is not pictured in this diagram, do not ignore the ingredient list. Items are listed in order of descending weight, so the higher up on the list something is, the more of it is present in the product. Do you want to know if the 0g trans fat label is accurate? You must look for hydrogenated oil on the ingredient list. Do you want to know if artificial sweeteners are present? You must check the ingredient list for aspartame, sucralose, and the like. Do you want to know if the sugars on the nutrition panel are naturally occurring or added? You must look on the ingredients list. Sugar can be disguised as corn syrup, cane syrup, brown rice syrup, dextrose, ribose, and about 100 other things. What to Eat, by Marion Nestle, is by far the most comprehensive and informative resource on my list. PhD Nutritionist Marion Nestle takes you aisle by aisle through the grocery store and explains what to look for in each food category.If you are struggling to learn more about which qualities are important in various foods (organic vs low fat, grass fed vs free range, etc) then I highly recommend investing in a copy of this book. I refer to my copy time and time again. In this TEDxTalk, Consumer Reports Environmental Health Scientist Urvashi Rangan explains which health claims on food labels are credible and which are not.This quick 15 minute video is something all consumers need to see, to avoid getting duped at the supermarket. Fooducate is an award winning app (created by Dietitians and Parents) for iPhone and Android that grades food choices. Unlike other calorie counting apps, this app considers other factors of food choices, beyond just the calorie count or basic nutrient profile. Based on your goals, it can be programmed to help you avoid processed foods, GMOs, or animal products, as well as programmed to help you select heart healthy foods, and to count carbohydrates. When reading labels, don’t fall prey to unhelpful labels. The USDA Organic seal has 600 pages of regulations behind it. On the other hand, “All Natural” simply means that there are no artificial ingredients. Lastly, don’t forget to check the ingredients list! Fruits and vegetables (beans included) are good for you no matter what, so be the most demanding with animal products (meat, dairy, eggs, and fish). From pasture raised to 100% grass fed, look for something that indicates that the animal was raised in an open pasture (or wild caught). At a Farmers market, you will likely have the opportunity to ask the farmer how the animals were raised. At the supermarket, I like the 5 Step rating program that Whole Foods uses to rank their meats (the higher the number, the better).